Toms Shoes Sizing Guide – Finding the Right Size | DressCodeClothing.com's Official Blog. Since 2006, Toms has come out with a variety of footwear styles for men, women and kids and has given more than 35 million pairs of shoes to children in need. Here is a guide to finding your perfect-fititng pair so you can help Toms help others. Toms Shoes run true to size which means that they are sized according to the US standard. 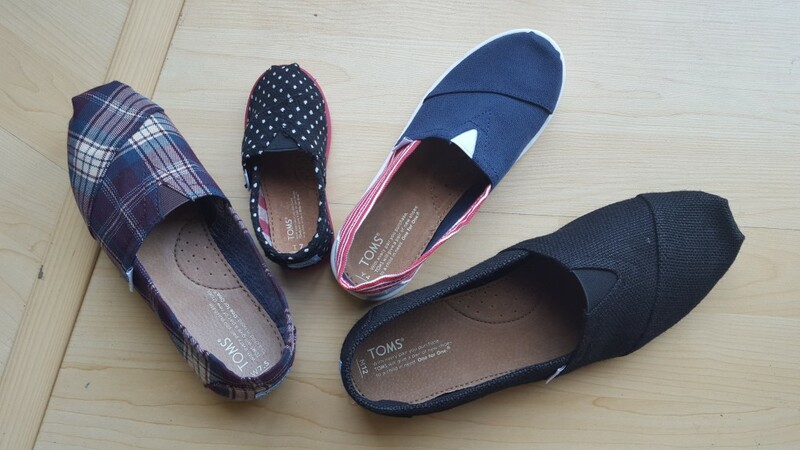 This also means that Toms don’t fit smaller or larger than a standard shoe and are only available in medium width. When looking at the insoles of a pair of Toms, you will notice a letter and a number on the inside sole of the shoe. The number indicates the size and the letter indicates whether it is sized “M” for men, “W” for women or kids (“Y” for youth or “T” for tiny). The “W” does NOT stand for wide. Below is a detailed shot of one of each of the different size of Toms. If you zoom in the pic you will see the letter. If you are usually in-between shoe sizes, I recommend going with the smaller size because within a few days they will stretch slightly to conform to your feet. Knowing how to go from men’s to women’s sizing and vice versa. For example if a guy wants the Women’s Classic Toms in Pink Glitter (don’t worry you’re secret’s safe with us) you would add 1.5 to your size to get the women’s size. So if you, the dude, wear a 10 you would need to order a women’s 11.5. Get it? Just reverse it if you want to go from women’s to men, subract 1.5 from the women’s size to get the men’s size. Keep in mind that men’s shoes run slightly wider than women’s shoes. To give you a better idea on sizing I interviewed a couple people at work to see what size Toms shoes they wear and what size do they normally wear with other brands. The Dude, AKA Fafa: Normally wears size 11 for most of his branded shoes. Also wears a size 11 in Toms. Monica (Female, seems obvious but you can never be too sure these days) : Normally wears a size 7 in all her shoes. She is still a 7 in toms! Unless you want to hook her up with a free pair in which case she can go up or down half a size. Anonymous male co-worker : Wears 12 for everything, including toms. The general consensus between the staff here at Dress Code: order the size you normally wear for most of your shoes and you should be ready to stomp! Check out all our styles and sizes here and find a pair that’s right for you. Also, be sure to check out our article on how to properly rock your toms. what about converting women’s size to Youth size. Is a women’s 8 or 8.5 (EU 39( the same as Youth size 6 – EU 39? I am interested in the OLIVE Leila bootie. I can range 8.5-9 & am not sure which size to buy. Can you help.